Mix rice flour, rava and maida in a big bowl. Heat 3 tablespoon of oil and pour it onto the mix with spoon first and then with your hand. Keep it aside for 5 minutes. After 5 minutes, add all other ingredients (EXCEPT WATER), and mix thoroughly with hand. Take a lemon sized ball of dough and make it into a small ball. Then, press it onto your palm to make a circle about ¼ cm thick. Once the oil is hot enough (check by adding a little dough to the oil, it has to come up immediately), add this prepared vada to it. Make 3 to 4 vade, one by one and add it to the oil. Deep fry it until both sides turn a light golden brown color. It usually takes 8 to 9 minutes. Remove it from the oil and place it onto a paper towel to drain extra oil. Repeat the same procedure for the remaining dough and the mix. 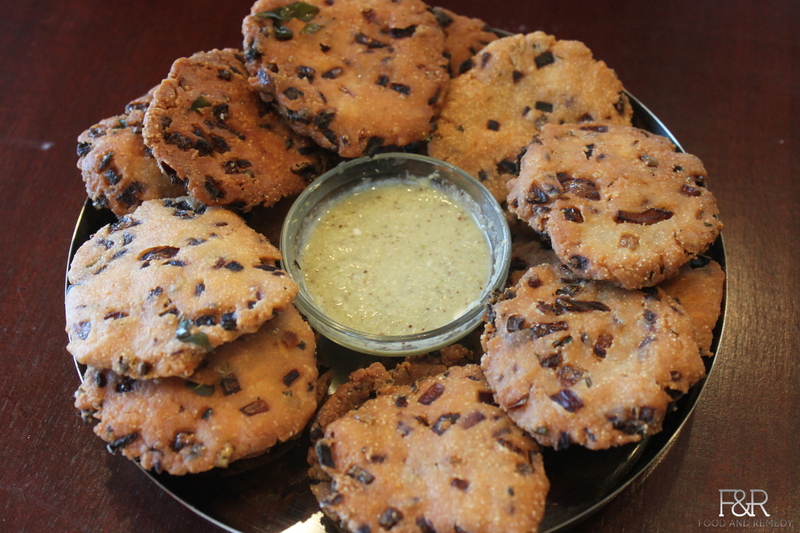 Enjoy the Maddur vada with Coconut Chutney. Perfect snack for winter, with a cup of Coffee or Tea. If there is a left over oil after preparing Maddur Vade, try out our another authentic snack, Nippatu! Great :) Let me know how it turns out! Tried this out today and they turned out very good. Thank you for the recipe. To make Maddur Vade more tasty add granules of roasred ground nuts and fried gram, three spoons each. Of course do not forget to add salt to taste. Enjoy more. Hi Rama Rao, for Maddur Vade, peanuts are not added (this recipe exactly resembles Maddur Tiffany’s maddur vada). for Nippatu, yes all of the ingredients you suggested is a requirement. But cooking need not be text book :), it is also variations and experiments. I will try your suggested recipe. Hi….thanks for the recipes…we have been trying out several of them with success. But the Maddur Vade came out real hard (bullet proof vade ! )……any ideas on getting it to come out softer. I myself tried this same recipe so many times never failed and many of my friends tried it too.. Hard to guess what went wrong, did you follow every step in this recipe? Nice Deepthi. Thanks for your feed back Glad you enjoyed it. Thanks for the recipe. I tried it out , it came out very well. I check all your recipes. Your way of showing the recipe is really simple and interesting to learn.